Why? Because there is no point. My chip is voltage limited. I cannot get 4.4GHz stable with below 1.3V and I don't want to feed it more volts. Sure some people don't care but I do. I don't want the power consumption of the CPU to increase by 50% just by getting that last 100MHz stable. Sure, if you run the CPU cooler, you can reduce the power consumption. In that sense it is worth delidding because that would allow you to du the CPU cooler at the same settings. Plus, I have the Liquid Ultra thermal paste with me. I'm going to do it differently. 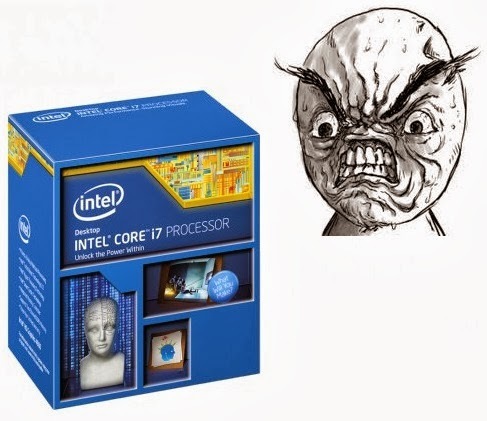 I'm going to see what Intel is going to with Haswell Refresh that's coming in next year. I'm sure it wont be much faster than what's available right now. But it might clock better. Again, there is good chance that I would lose the silicon lottery once more. That's become a bad habit of mine. But I will no do anything else with this CPU. I wont try to tweak it anymore. I wont buy faster RAM because it would not be noticeable. I won't add another CPU fan to make it run cooler. All those are diminishing returns. I would put all best I have towards the G710+ keyboard, G602 wireless mouse and a R9-290X graphics card. Oh btw, I ordered a new set of headphones. It w's neither the AD700X nor the G430. It's the AD500X. I felt that I was not audiophile enough to notice the difference between the 700X and the 500X. the 500X is about half the price of the 700X. These e are Japanese prices, so usually much less than rest of the world. I'll right about them on a separate post.